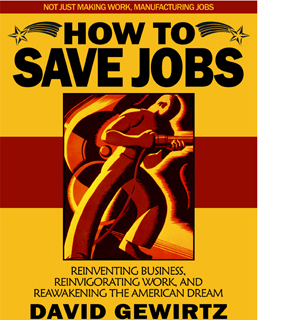 Editor's Note: This article continues our series excerpted from AC360°'s contributor David Gewirtz's upcoming book, How To Save Jobs, which will be available in December. Over the next few months, we'll be excerpting the first section of the book, which answers the question, "How did we get here?". Last week, we discussed A short history of jobs This time, we'll look at riots, massacres and the transactional nature of work. To learn more about the book, you should follow David on Twitter @DavidGewirtz. Protesters in the United Kingdom gathered outside an oil refinery this summer, after hundreds of striking workers were laid off. In today's civilization, it's virtually impossible to survive without money. One-hundred-and-fifty centuries ago, if a Natufian wanted to build a hut, he'd find an empty spot of land and dig. But, today, if an American wants to build a house (or even a hut), land has to be bought. If you want to live inside a structure, a transaction of some sort has to take place and that requires money. It is the transactional nature of a job that creates its complexity in terms of the rest of society. If you want to work for someone else (and have them pay you), you have to convince them that employing you will meet their needs. If you're self-employed, you have to convince prospective clients and customers that hiring you will meet their needs. In other words, getting a job or getting a gig requires some level of marketing to make someone aware you're there to do the job and some level of sales to convince them you're the right person for the job. Over the centuries, the nature of work evolved to eventually result in the world of employment we've all come to know and love. There's now always someone buying work and someone else selling it. The transactional nature of work has also led to all sorts of power imbalances. When there's too much work and not enough workers, it's a seller's market and the workers have more power over what jobs they accept and at what pay level. When there's not enough work to go around, we have a buyer's market and then the employers can set the terms, confident that if one worker won't accept the pay or conditions, some other worker will. This power imbalance has led to some seriously bad situations. The 1999 massacre at Columbine High School wasn't the first Columbine massacre. Back in 1927, in a town with the sadly ill-suited name of Serene, Colorado, miners at the Columbine Mine went on strike. More than 500 miners had brought their families to the mine as part of their strike demonstration. Members of the newly-created Colorado state police, dressed in civilian clothes, blocked the miners' path to the mine. A fight broke out, machine guns were fired into the crowd of demonstrators, and five of the striking workers were killed. On May 26, 1937, members of the United Auto Workers planned a demonstration at the Ford River Rouge car plant. The union wanted workers to make $8 for a six-hour work day, instead of the $6 for the eight-hour day they were then working. Adjusted for today's money, workers were making about $11.25 an hour and the union wanted wages raised to the 1937 equivalent of today's $20 per hour. Timed for a shift change with 9,000 workers cycling through the plant, union organizers planned a photo-op. Two of the organizers posed in front of a Ford sign for Detroit News photographer James E. Kilpatrick. Reports claim that as many as 40 members of Ford's security force came down on the workers, leaving the demonstrators battered and bruised, and at least one demonstrator was left with a broken back as a result of the beating. 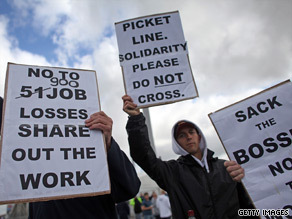 These are just two examples of protests and fights that have taken place between employees and employers. American history is filled with stories of labor riots, like the Haymarket Affair that took place in Chicago's Haymarket Square in 1886. A bomb was thrown at police, eight police officers died, eight protesters were charged with murder, four were put to death, and one committed suicide while serving time in prison. Stay tuned. Next up, we'll look at our changing relationship with work.